Storm Brewing in Vancouver Has the Right Ideas, A Sense of Humor and Pay As You Want Samples – Why Am I Not There? You can visit Vancouver from different perspectives. There’s Asian-foodie experience, where every cuisine is representative from the East. The Asian population are almost the majority in the city. Then there’s the Hollywood North angle since a good portion of American movies (Deadpool) and TV shows (X-Files) come to Vancouver for cheaper production. Plus, it’s Seth Rogan’s hometown and now provides the voice of the transit system. Hopefully, his annoying laugh is not included. Finally, and probably the reason I dedicated a good portion of my time doing, the city is the unofficial craft beer capital of Canada. Not many names come from Canada into the USA, the few being Vancouver’s Pipeworks, Unibroue from Montreal and the proverbial Molson macrobeer. For my craft beer experience, I made sure to visit the city’ first, Storm. It’s a bit east of the Gaslight district among warehouses so just take the bus along East Hasting Ave. Don’t walk it, because you’ll pass plenty of homeless encampments. 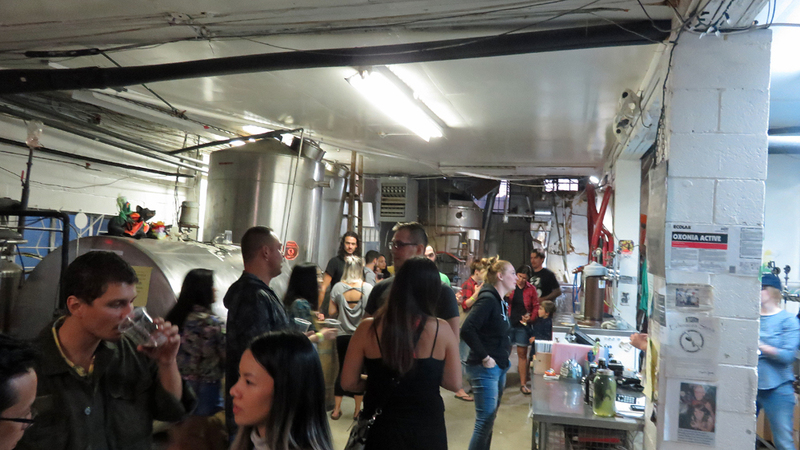 Once you get to the area, there five breweries within four blocks. The set-up and philosophy is unique in my experience. You’ll notice right when you enter the space how different Storm Brewing is — there’s no taproom. There’s no bar, tables, stools, merch area, food menu or cute chalkboard of what’s on tap. It’s a production space with some space to stand. You’ll be hard pressed to find a flat surface to set your beer. Try next to the toy rat in a jar. Then the other unique quality — pay what you like for six 4-oz. samples. 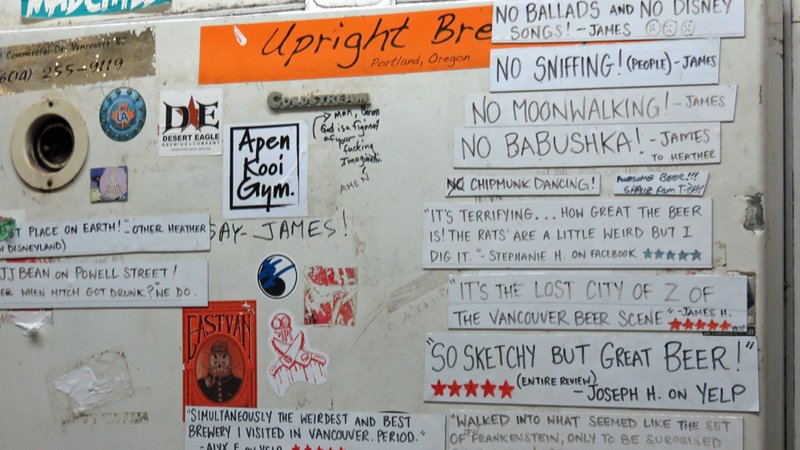 The theory is that you’ll pay for growler. You’ll get a card to keep track. Since I wasn’t doing it, FREE BEER! Joking, $5CAD spot was my donation to the cause. Without all the brewery trappings, Storm Brewery allows you to mingle with the staff and locals because there’s not much else to do besides stand, talk and drink some great beer. That could be beer or an ice cream menu. 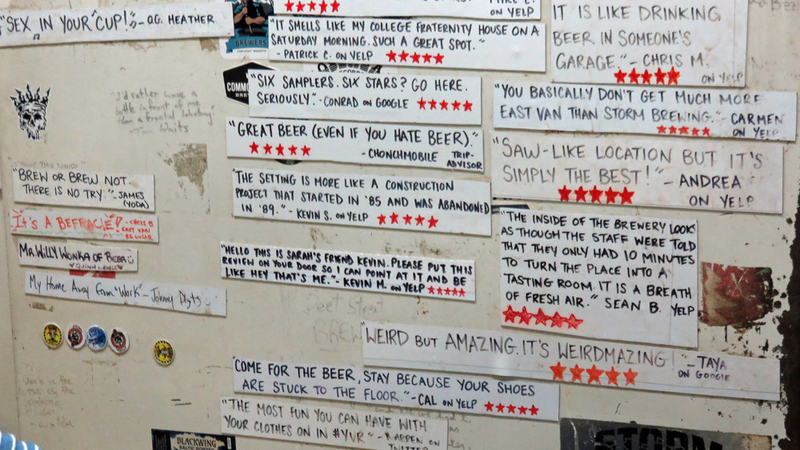 When you visit, make sure you check out the wall of their Yelp reviews — good and bad.